From Beeline Creative. Marvel's greatest heroes and villains are going Tiki! 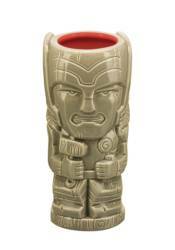 This Geeki Tiki stands approximately 7-inches tall and is made of durable ceramic that is top-shelf dishwasher safe and microwaveable. This Thor Geeki Tiki mug holds up to 15 ounces of your favorite beverage. Collect all your favorite Marvel characters!